As I said in my last derby post, the next bout I’d be going to would be on my home turf which was very exciting. The London Rollergirls needed a home for the Anarchy III event, so my local Surrey Roller Girls volunteered up the Guildford Spectrum. For a spectator, it was such a great venue to watch roller derby in. The tiered seating was brilliant for watching the action – I think some people were disappointed at the lack of suicide seats but I had a Lovely Dress on so wouldn’t have sat on the floor anyway. Vendors village was awesome – I always manage to search out the jewellery and managed to get a charm of my favourite skater, Kamikaze Kitten, made by Startle Derby. All of the teams were selling t-shirts, so I got a Surrey Roller Girls shirt and managed to peer pressure Mild Concern Tim into getting a Surrey one (he also bought an Auld Reekie Roller Girls t-shirt – I think his intention is to get as many different team shirts as possible). Obviously, the main reason for the trip wasn’t shopping. The games were AMAZING. I’ve said this many times, but I am probably the least competitive person out there, so I don’t tend to get sports. This I get. The first bout was between Auld Reekie and the Berlin Bombshells (“I say Berlin, you say BOMBSHELLS!”). I decided to support Berlin (completely arbitrarily) and although it was a closely run thing, they only just lost out to ARRG. 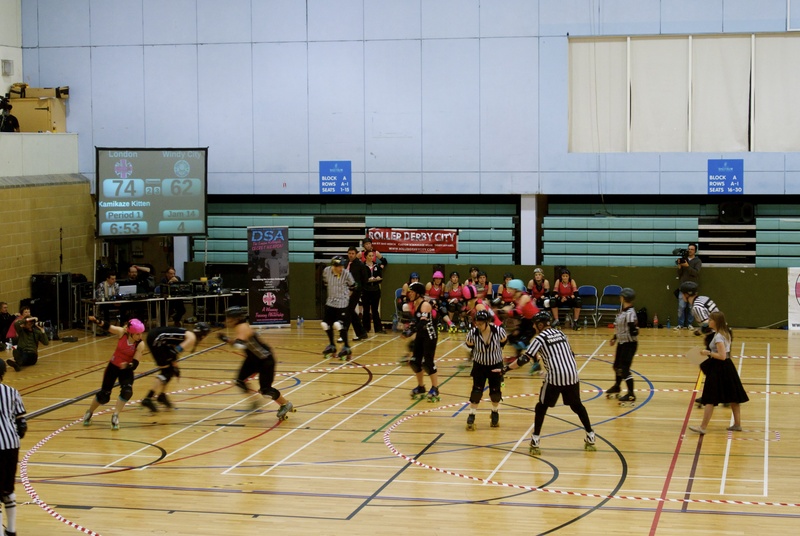 And then the bout that destroyed my throat – London Brawling vs Windy City Rollers. Oh. My. God. This match was something else. We had a group of good natured Americans screaming for their team behind us which really added to the atmosphere and I can honestly say I’ve never been so excited for sport before in my entire life. Kamikaze Kitten was awesome – the way she leaps over anyone in her way is just incredible. She was lead jammer for a lot of the bouts and helped London Brawling get an early lead, but the whole team were fantastic. Towards the end of the bout, Windy City just edged ahead which made for some very tense jams. As the game ended, Windy City had the win and my voice had cracked. I’m gutted I didn’t decide to go on the Sunday as well – looking at the scores, it seems as though there would have been some amazing skating on that day too. I cannot wait for my next bout, whenever that may be. And I also can’t wait to see what t-shirt Tim will buy next.